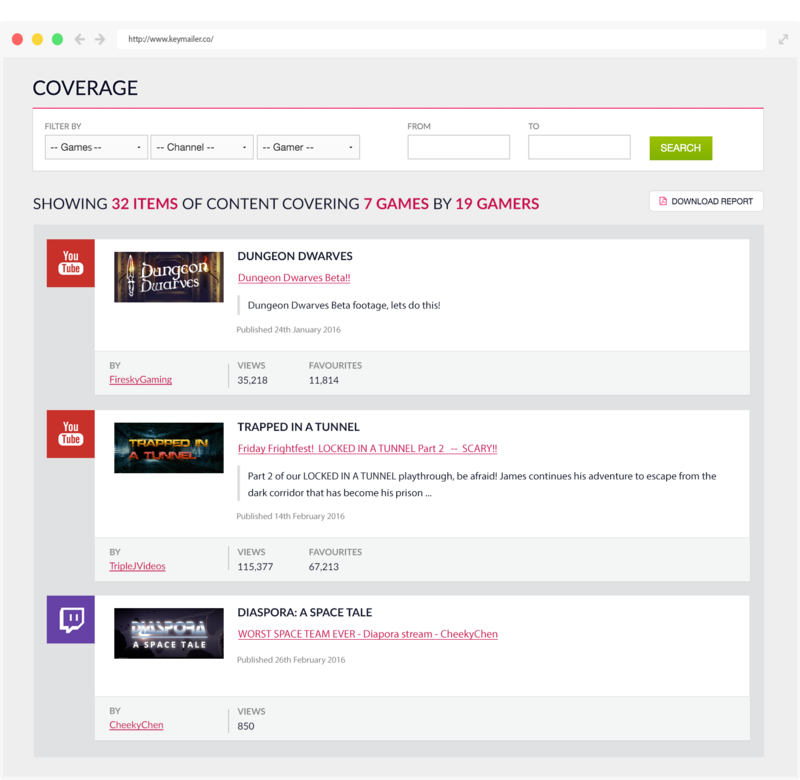 Keymailer is the free leading platform connecting your company's games to YouTube, Twitch and Mixer content creators and their fans. Keymailer simplifies working with content creators. We make it quick and easy to send out keys to the right people, and track how much exposure your game is receiving in real time. YouTube, Twitch and Mixer influencers request a game key from you. Check their credentials against our live database. If satisfied, send out keys and details of tags you'd like used. 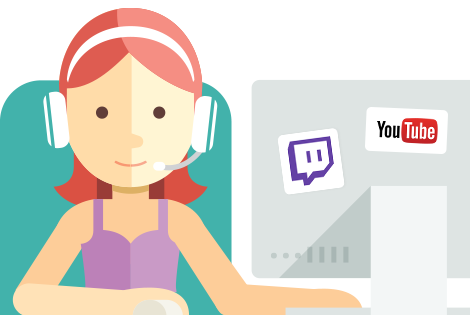 Your free Keymailer account also tells you when a game key has been used, clips the coverage on YouTube, Twitch and Mixer, builds campaign reports on demand, and tells you who is being most influential for your game. Keymailer is the most amazing tool for PR and Marketing that I have ever used. Having worked on more than 570 games to date, I have never found such an easy solution for doing a huge part of my job. I recommend Keymailer to anyone looking to reach influencers in the best and most efficient way imaginable! 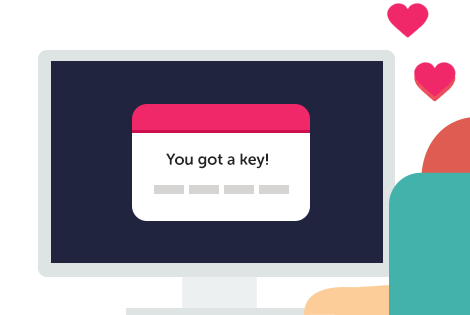 I am so pleased that I have found this service, feeling overwhelmed at the amount of requests I have received and it is wonderful to just direct people to Keymailer as a way of getting keys. Keymailer is an invaluable tool. It gives reach and coverage that previously would have been impossible or very difficult to achieve. Using Keymailer has revolutionised the way that we work with influencers giving us the ability to reach so many more people in far less time than we could manage through traditional means. 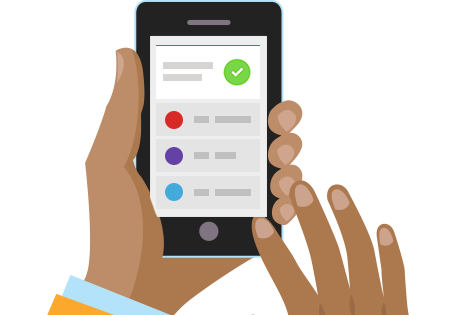 We now don't waste any codes and can accurately report on how successful our campaigns are. In short, Keymailer delivers on all of its promises. This really is amazing! We've been sending keys out all week and on average it's taken us 1 hour of emailing per 1 key activation. In 10 minutes of using this, 2 keys have already been redeemed. Keymailer provided Renaissance PR an easy to use, efficient way to communicate with influencers on behalf of our clients. Time consuming tasks are the worst enemies of communication agencies, and be able to distributing keys directly using a simple tool that also provides efficient and trackable reports is invaluable for every PR professional.